Rio's Attic Fiction Why Do We Love Him|? Because I've got a very recent access to Internet, it's only a short time ago I've discovered all the sites about River and especially yours. And the sorrow felt six years ago suddenly came back again. At my own surprise it was as strong as it was in 1993, may be stronger because those emotions were reinforced when I found out we're so many caring for him and his memory. I was happy to contribute to what you've built. I had to tell you and your other visitors I share your feelings towards River. Few weeks after, I'm still amazed by the effect of what I've read in Rio's Attic and by my own reaction to that six years ago death of an almost unknown young man. Why a man living in a far country, with a quite different culture, was personally moved so much by a boy he has only seen on screens and over all why that man still feels something called sorrow many years after the loss of the young man the boy had become? I must admit this is a problem for me. I was not a family member, not a friend. Of course River and I never met and I still resent his death as if I was all that. Perhaps because I'm French and we like to preposterously consider ourselves a very logical people (I think therefore I am! ), I don't go along these non-logical feelings so easily. I resent them in a way. I know feelings have nothing to see with logic but in this case, aren't we a little bit too far beyond normality? So it seems to me important to understand and analyse those emotions and I would be very happy if those reflections could find some echoes among you and the people concerned by River. I also recognize this letter is in a way as much about us, about me, than about River himself.
" I lied and I contradicted myself to destabilize people "
River's last interview by Jean-Paul Chaillet for the French edition of Première. December 1993. It is said the interview took place in Los Angeles a few days before River's death.
" My ideal would be to stay dumb as River "
And loved the sorrows of your changing face "
" When you are old ", poem by William Yeats.
" 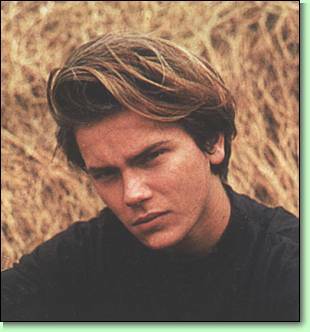 Como o teu nome, diferente, nos induz uma paisagem de inocência "
From the very nice song carta a um jovem ator (letter to a young actor), by the Brazilian singer Milton Nascimento, dedicated to River Phoenix after he saw The Mosquito Coast.
" Verweile Doch! Du bist so schön "
This is from Goethe's Faust. It may seem excessive, but it is not and it speaks for itself. Actually, it's what Faust says to a beautiful moment but it's perfect for River and his leaving us.
" A battery charger "
River's own words about his family.
" For me, the ideal pleasure, what makes me really happy, is to create something new "
River's own words in his last interview already mentioned. All the quotations of that part come from the same interview.
" Parce que c'était lui, parce que c'était moi... "
Michel de Montaigne’s famous definition of his friendship with La Boétie. Every French teenager is supposed to know it!
" You're just too good to be true... "
" Das Trinklied von Jammer der Erde "
The first lied of "Das Lied von der Erde" (The Song of the Earth) by Gustav Mahler on Chinese poems. Everything about River here: Song, Drink, Sorrow and Earth. The words explain the choice of this poem but for the music, please, do go to the last lied "Der Abschied" (The Farewell) where each note and each word would have been appropriate to describe our friendship for River and his death. And the most beautiful music ever. Listen to the poignant voice of THE contralto of all time Kathleen Ferrier.
" Ich bin der Welt abhanden gekommen "
Gustav Mahler again. One of the five Rückert-lieder. The most peaceful and moving farewell music and words full of meaning for River.
" Laudato si', mi Signore, per sora nostra matre terra, la quale ne sustenta et governa, et produce diversi fructi con coloriti flori et herba "
I explain Saint Francis poem in the essay.
" Tâchons d'entrer dans la mort les yeux ouverts... "
The last words of Memoirs of Hadrian by Marguerite Yourcenar, the best French writer of the century in my opinion. She lived for almost 40 years in Northeast Harbour, Mount Desert Island, Maine and she was the first woman ever to be elected to the French Academy in 400 years. The meaning is clear enough.
" Finally I'm someone simple enough "
River's last, last words in his last interview. I’ve only got it in French, so I don’t know River's real words in English and made the translation myself. Maybe he said " Finally, I'm a simple enough person " (The French words are : " Finalement, je suis quelqu'un d'assez simple. ") Well, it’s not that important.